There's something really wonderful about the combination of flavors in a sweetly ripe strawberry covered with rich chocolate. As much as I love chocolate dipped strawberries, this is the first time I've ever tried to make my own! I think I was afraid of the chocolate melting process. Well, I'm over that hump now. The first obstacle is that all the recipes for melting chocolate call for special doo-dads and fancy gee-gaws. A double boiler. A heat resistant bowl. Candy thermometer. Tempering the chocolate. Well, I'm here to tell you one-dot cooks like myself, none of the fancy accoutrement are necessary. Wanna see what I used? I opted for this not-very-attractive, but extremely cheap (it's what I had in the cupboard) solution: two old pans, one set inside/atop the other. No thermometer, no tempering, no special doo-dads at all. It doesn't get much simpler than this. And my strawberries were delish. The bottom pan held about 2 inches of water, boiled and then set to simmer. The top pan was big enough to just sit on the rim of the bottom pan, so it acted just like a double boiler. I did need to tip the top pan when I did my dipping, especially when it got down to the last of the chocolate, but as long as the top pan doesn't touch the water or get directly onto the burner, and no steam from the bottom pan gets into your chocolate, you're ok. The idea here is to keep the chocolate from scalding. You don't have to have fancy equipment. One note, though, if you use a highly heat-conductive pan, like I did, you do have to stir the chocolate frequently as it melts. Boil the water in the lower pan. Place the second pan on top, with the chocolate in it, and lower the heat to allow the water to just barely simmer. Stir frequently as the chocolate melts. Add flavoring if desired. I added 1/2 tsp orange extract. Almond extract would be delish, as would a smidgy of Southern Comfort. Do I have to say wash and dry the strawberries? Hmmm, well, washing should be assumed, but drying is important so the chocolate adheres better, and to prevent any water from getting into the melted chocolate and ruining the consistency (something called "seizing"). Place a sheet of wax paper on a cookie sheet. 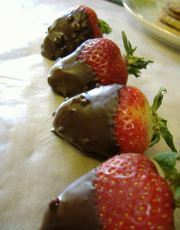 Dip strawberries by holding onto the leaves and giving a little twirl as you lift it out of the chocolate. 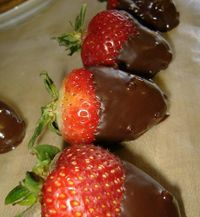 Place dipped strawberries on the cookie sheet, and set in refrigerater to cool and harden. I chose not to fully coat the strawberries, because I like seeing a bit of red fruit there, but many folx like to completely cover the strawberry with chocolate. Strawberries and chocolate are both my favourites. What a perfect match! As I am going more health conscious now, I will go with more dark chocolate instead. That looks yummy.Those stawberry's coverd with chocolate looks so much delicious.i wish i could have some of them.. This is awesome! My daughter loves it so much! Fabulous recipe. Love it! Thanks! Loved your recipe, really enjoyed your recipe. I am diabetic, then I was wondering if there is a substitute for chocolate in order to try this fabulous recipe without harming my health. I made this recipe for my girlfriend to our anniversary, she was so happy and of course that I prepared this because that little tale, you know strawberries have a little bit colateral efect. The strawberry is technically an accessory fruit, meaning that the fleshy part is derived not from the plant's ovaries (achenes) but from the receptacle that holds the ovaries. Loved your recipe, but really enjoyed your personal comments and helpful hints. I'm heading to the kitchen. Thanks! Strawberries dipped in chocolate is my favorite, followed closely by strawberries dipped first in sour cream then dark brown sugar. Yummmm !